NPSS is published twice a year. The journal is open to all social sciences disciplines, to each of them as well as to their combinations. Because there are as many rich discoveries within well define frameworks than within multidimensional structures. 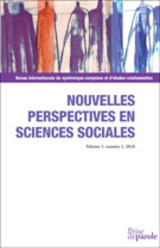 This journal is published in French only.